Florida Shark Diving- Killer Way to spend my Day! January 28 - West Palm Beach, Florida. We just returned from Tiger Beach. I said good bye to our friends who joined us and then prepped my dive gear. 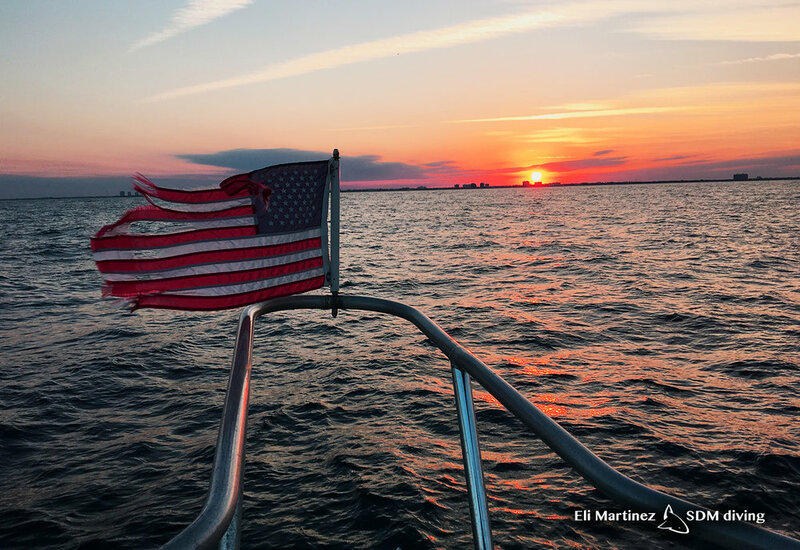 I wanted to check out the local diving and was invited by Ryan, the owner of Deep Obsession charters. The only problem was when we arrived it was cold as hell. we had left the Bahamas and it was windy, but warm. Here in Florida, it was rainy and really freaking cold. I was rethinking my decision to go diving. 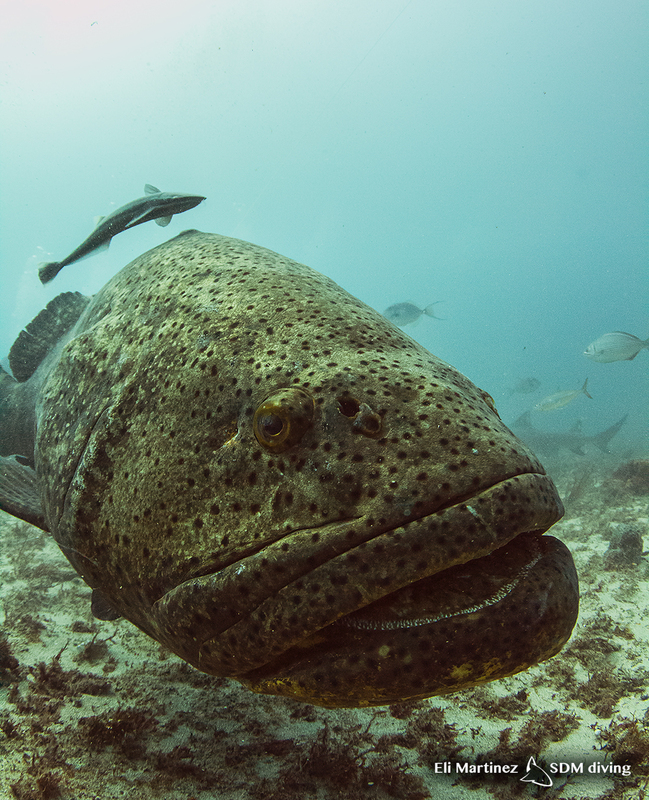 We dropped in for the first dive and were greeted by a couple of goliath groupers. Damn, I love these crazy big fish. They are just cool looking and so massive. We also had a bunch of lemon sharks with us and I totally ignored them. I was busy chasing the goliath’s around, trying to get some shots of them. The photos for me here are challenging because I shoot natural light and it is so deep (80 - 90 feet), that the deeper images do not pop like when I shoot shallow. Maybe one day I will attach my strobes? So I was taking a few pics of the grouper when I noticed one lemon that Ryan was playing with acting a bit different. I quickly left the groupers and swam over to watch what was going on. One of the lemons, they call Stevie, was coming in for a nose rub and just dropping onto the sand. It was amazing to watch, Ryan would grab her nose, no chain mail stimulation and no real rubbing going on and the shark would drop. He did this over and over. My total focus tuned into that one shark. I watched her swimming around. I found out pretty quickly that she is blind from one eye. The one thing I noticed was that as she swam around, she kept bumping into everything and everyone. At first I thought it was because of her eye. But that just seemed too clumsy and we have one eyed lemons at Tiger Beach and they are not that clumsy. But, as I continued to watch her, I realized that she knew exactly what she was doing, she was purposely running into divers, seeking out attention. It was so wild. My excitement grew. This was new behavior that I was witnessing and I wanted to learn more. She had a comfort level with the divers that none of the other lemons there shared. She followed us up and Ryan kept playing with her. He would grab her nose and she would drop. It was such an amazing thing to witness. I have always said that lemon sharks are one of the most intelligent of the shark species and here I was learning something new. She followed us all the way up to the surface and he played with her all the way up. I was on fire, and extremely happy I decided to visit. 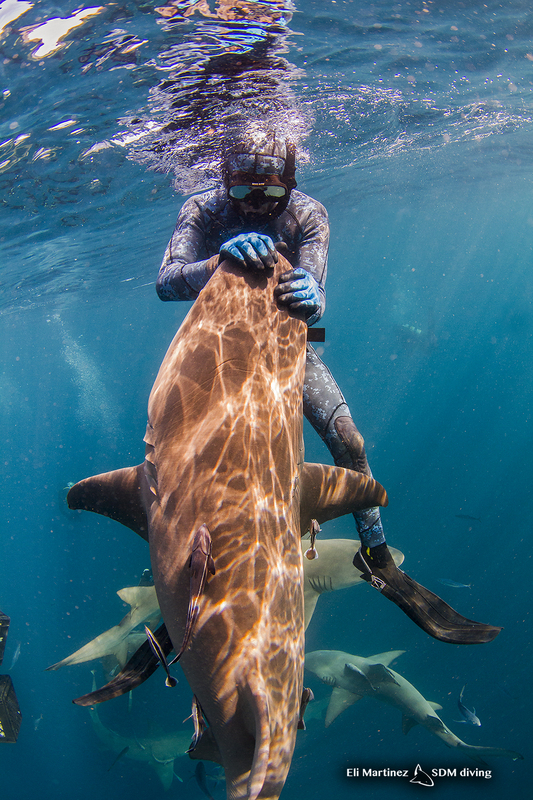 I have been documenting lemon shark behavior and this one is definately going in the book. 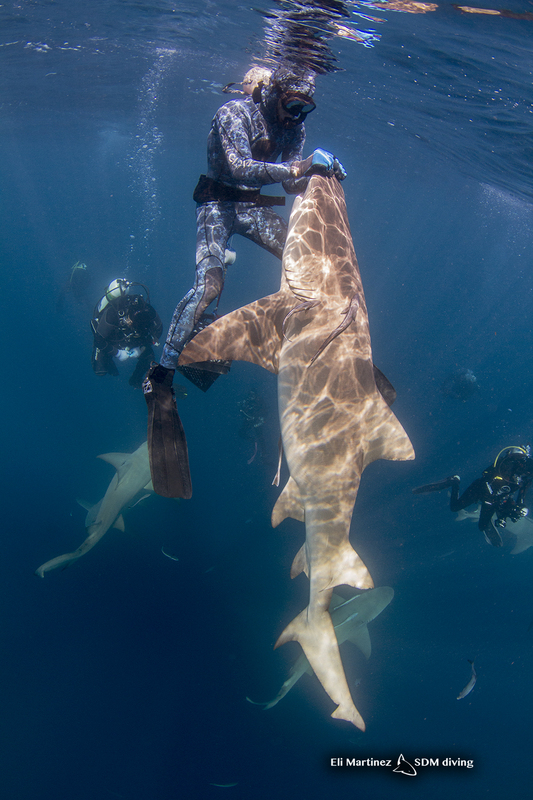 We dropped in for our second dive on a spot where they regularly see tigers and great hammerheads. As we were dropping in, We saw this huge loggerhead turtle laying in the sand. I have never photographed one before so I raced over to shoot it. I felt guilty as hell because my Waterbug (my daughter) was not with me to see it. Sea turtles are our thing that we do together. So I haven't even told her yet. The action was slow, it took our entire dive, but we finally got a great hammerhead in. He grabbed a piece of bait and then took off. The encounter was brief, but I was satisfied. I really wasn't thinking about the hammer anyway, my mind just kept going back to Stevie the lemon shark. I was excited knowing I learned something new about these amazing sharks. It makes me excited to get back to Tiger Beach and see what new things I can learn from my lemon sharks there. I wont have to wait long, I am headed back out to Tiger Beach tomorrow night. The adventures and my education continues. Newer PostTiger Beach...Thank You Ocean Gods! Finally, we have beautiful weather. Older PostTiger Beach - We Pulled it Off... HELL YEA!